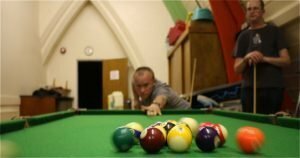 At Youth Club, we go bowling, do the low ropes, trampolining, have art sessions and make use of the Hall and Mote Park. At our Hall, we have table football, pool, basketball hoop, football, ball pool and sensory room. In the warmer months, we hope to have a BBQ. We welcome young people with additional personal care or medical needs, as we can provide a 1:1 Helper. Before a young person starts Youth Club, we need some information about them about their likes, dislikes and needs. Please contact the Clubs Manager before attending a Youth Club session. Who? 16-25 year-olds with a learning disability. Now running on two Thursday evenings of every month, depending on activity available and staff. The below dates are subject to change. We will give plenty of notice. We will confirm activities nearer the dates. Sessions must be booked in with the Manager prior to attending the Club. We are running our fun-filled Easter Club again this year. Please find details, application form and admission form below. For further information about Youth Club, please call or email Susan.